Dangal isn't a film just about women wrestling but it is about daring to dream, challenging the status quo, not just determined but being obsessed about your dream. On prima facie it is an inspiration film for women, who have championed in the areas which were said to be male bastions. But if you deeper, film also shows arduous mamooth efforts and huge sacrifices to be given (by self and family) to become a champion. It also exposes the infrastructural flaws for sports in our country, unless that sport is cricket. 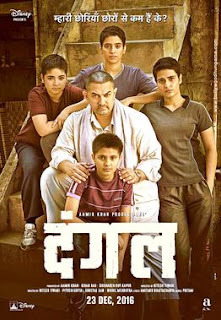 Film is based on true story of wrestler Mahavir Singh Phogat (Aamir Khan), who trained his daughters Geeta Phogat( Zaira Waseem and Fatima Sana Shaikh) and Babita Kumari (Sanya Malhotra) to become international wrestling champion. Plot is quite linear and fast paced and starts with unfulfilled dream of Mahavir Phogat, who couldn't represent India and win a medal for country. How the idea germinates in his mind to train his daughters? What all emotional, societal, family, financial and infrastructual challenges are faced by him? How he beats all odds despite his limited resources and yet gives India international wrestling icons. Dangal is directed by Nitesh Tiwari (who has given duds like Bhoothnath Returns and Kill Dill). It was quite audacious of producers Aamir Khan, Kiran Rao and Siddharth Roy Kapur to trust a newbie like him without any past great success. Nitesh does a terific job as a master storyteller keeping the narration simple, fast paced, engaging and very much focused. He gives audience get a realistic feel of Akhara and pehelwaans with title track Dangal in background with voice of Daler Mehandi. Other than the game of wrestling, Nitesh beautifully captured the "internal wrestling" being played in the minds of characters. There is a beautiful line in movie where Aamir says, "Dar se to ye jeet hi gayi hai, ab khel bhi jeet legi"
I liked the fact that film isn't a mechanical documantary listing of all important matches and events of Geeta and Babita. But, there is a deeper story associated before and after each crucial event and viewers can relate with the joy, sadness, pain and desperation of protagonist at different junctures. Even towards the climax scene there isn't any unnecessary Bollywood cliched masala where Babuji appears from nowhere and a losing battle is won with chamatkari baabuji ka aashirvaad. Thanks a lot Nitesh for keeping the film realistic! Film also questions whether it is OK for a father/mentor to be obsessed with a dream and prepare/train his candidate towards that dream? Is it being unfair and unrealistic to force someone else relive your dream? Or one should give credit to vision of mentor and his ability to identify talent and give him/her right training and guidance. Isn't that how Olympic gold medalists are prepared in China? In this film and many other sports films, it is shown that champions are also a great extent lucky where they get access to a good coach, their family makes sacrifices to ensure no compromises done in training, they manage to overcome politics and get a chance to show their talent. One has to be really privileged to get all this. Really? Isn't this is something that should be given by default to every talented sportsperson in India? One always fall short of words while praising acting prowess of Mr perfectionist. Like in every film, he didn't play the character but he became that character in every aspect. He looks like a wrestler, talks like a wrestler, rides scooter likes a wrestler and breaks down like a wrestler too. Enough has been already said about his body transformation from a lean to fat and back to lean body. He refused the use of any prosthetics and wanted to gain and lose weight in real. Sakshi Tanwar has a small role in the film as Mahavir's wife which she does fairly well. I was amazed by acting skills of confident debutant Zaira Wasim (young Geeta Phogat). Fatima Sana Shaikh (as Geeta Phogat) impresses as well with her authentic wrestling skills. Aparshakti Khurrana (cousin of Geeta in film and brother of Ayushman Khurrana in real) has a nice role but he fails to create any impact with a forgetful performance. Film's music is superb and gels very well with each situation. Viewers should love the usage of local haryanvi words in songs like Dhaakad, Bagad Billi etc. "Haanikarak Baapu" is quite creative and catchy. Dhaakad and Dangal would make you feel like rolling up your sleeves and get into Akhara. Gilehriyaan is a cute number where the caterpillar Geeta metamorphise into a butterfly. Film is made with a reasonable budget of Rs 70 Cr despite starring Aamir Khan and all that moolah spent on marketing. Verdict: Overall a fantastic clean inspirational film suitable to all genres. One of the best films of 2016 with very good chances of winning filmfare awards. Screenplay and debut actress (for Zaira Wasim) are indeed 2 strong categories. Good luck film makers and hope you get 2 thumbs up from viewers!